Since receiving final permitting from the Corps of Engineers and the Illinois Department of Natural Resources, the owner has been developing a 65-acre site for a proposed multimillion-dollar grain elevator and barge-loading terminal on the Mississippi River in west central Illinois. Greg Dolbeare is the owner and principal of SIMCO, short for Sny Island Merchandising Company. Dolbeare—who graduated from high school in Louisiana, Mo., just across the river from Pike County, Ill., where the terminal is located—has worked, like his father, in the grain-handling business for most of his adult life. Besides construction a loop track rail loading facility at Lowder, Ill., Dolbeare has worked at terminals on the inland waterways at Aurora, Ind., on the Ohio River and at Frederick, Ill., on the Illinois river. 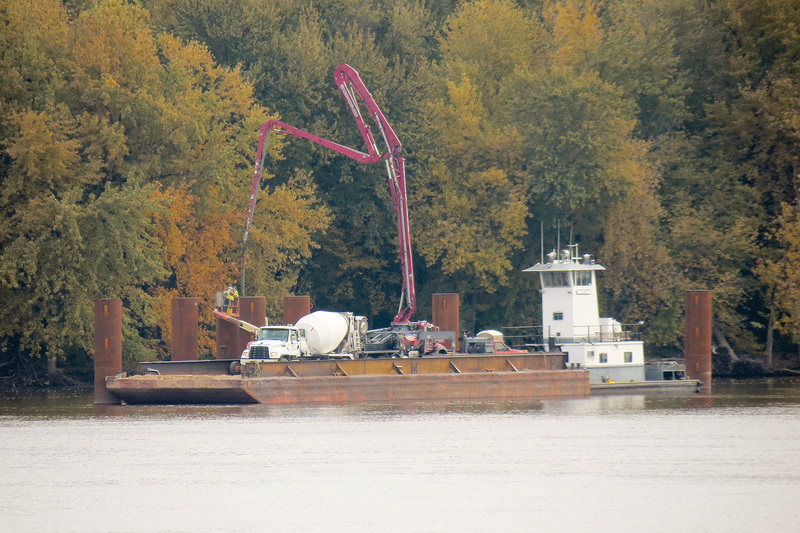 When completed, the SIMCO terminal will be the only barge-loading facility in Illinois between East Hannibal and Alton. The facility will be situated between the Champ Clark and Louisiana railroad bridges. Plans provided to the Corps call for building six 200,000-bushel-capacity grain silos with weigh scales, two grain pits for truck unloading, a conveyor system to the river, an office and roads in an existing cleared area adjacent to the Sny Levee system. The proposal states that SIMCO plans to have Wayne B. Smith Inc. (WBS) handle the barges. Four 6-foot-diameter dolphins will provide secure buffer and mooring structures. Dolbeare said he is still planning for a total storage capacity of 1.2 million bushels. He anticipates the site handling mostly corn and soybeans, although it could handle wheat and other grain products as well. A covered conveyor, about 950 feet long and supported by piers, will cross the Sny Levee and proceed through a corridor that has been cleared on a peninsula in the river before being supported by a loadout tower built in the four center piers already constructed on the river. “It’s a nice location coming off the new bridge,” said Dolbeare. Part of the plans call for a new concrete truck entrance off U.S. Route 54 at the east end of the new bridge. The Champ Clark bridge, built in 1928, carries Route 54. It is in the process of being replaced with a new bridge, which will keep the same name. In March, the Massman Construction Company team completed all underwater work for the eight drilled shafts that will support the new bridge. The next phase of construction involves work on the concrete substructure for the piers in the water and work on the approach piers from the Illinois side of the bridge.